How a given cheese tastes is the result of a number of factors. First and foremost, of course, is the type of milk used: a cow's milk cheese tastes different from a sheep's milk cheese, and a cheese obtained from a combination of water buffalo's milk and goat's milk has its own personality. The place where the cheese is produced (more on this below), the season in which it is produced, and how long it is aged are also major determinants of flavor: in general, summer cheese tends to be more flavorful, because the animals feed on aromatic fresh grass and wild herbs rather than dry fodder; and the longer a cheese ages, the sharper and saltier it becomes. The place where a given cheese is produced is fundamental to determining its flavor and character. Because Italian dairies tend to process milk only from a delimited, and often quite small, area, the regional specificity of Italian cheeses is quite pronounced. Cows, goats, sheep, and water buffaloes munch on grass and hay in their natural microenvironment; the grass and hay confer a specific taste to the animals' milk, yielding cheeses with unique characteristics. Simply put, cow's milk around Novara (Piedmont), say, tastes different from cow's milk around Bari (Apulia); therefore, a cow's milk Ricotta produced in Novara will taste different from one produced in Bari. This is akin to the soil specificity of grape varietals in winemaking: the same grape varietal planted in two different locations will yield different fruit, and therefore, different wines. Not surprisingly, just as for Italian wine, Italian cheeses are safeguarded and protected by a denomination system: roughly 30 Italian cheeses are now labeled DOP (Denominazione di Origine Protetta, or Denomination of Protected Origin). These DOP cheeses must be made within a given production area according to strict guidelines, and owe much of their character to their place of origin. The DOP cheeses are Italy's most widespread cheeses, and, thankfully, nearly all are available in North America. The Italian word for cheese, formaggio, may be derived from the Latin formaticum (which describes the reed baskets in which curds were set to drain and mature) or from the Greek formos, for shape (meaning the mold used to shape cheese). The texture of cheese depends largely on its water content: the more water is drained out, the drier the cheese will be. Some cheeses, like Crescenza, are runny, almost liquid, while others, particularly the grainy grating cheeses like Grana Padano, are dry and crumbly; of course, the younger, fresher cheeses are moister, and the aged ones are drier and more friable. 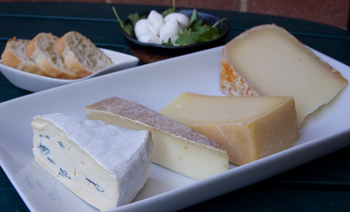 A number of Italian cheeses are best suited to eating at the table, and others are ideal for cooking. But most are versatile enough that they can be savored raw or cooked. Keep in mind that cooking a cheese (or a cured meat such as Prosciutto, for that matter) will tend to attenuate its unique character: if you really want to savor that perfectly aged Robiola, you might be better off eating it with a hunk of country bread than stirring it into a pot of Quattro Formaggi (Four Cheese) sauce for your pasta. In Italy, cheese appears at nearly every meal: sometimes it is served as a course on its own, after the main course in place of dessert; other times it is incorporated in dishes as diverse as pizzas or risottos. Of all Italian cheeses, the most famous is Parmigiano-Reggiano, a crumbly, grainy, nutty-flavored raw cow's milk cheese that hails from Emilia-Romagna; there are few Italian kitchens that don't keep a wedge of this cheese on hand at all times. Mozzarella, Pecorino, Grana Padano, Fontina, Gorgonzola, and Taleggio are also prized across the country. But despite the prevalence of these cheeses across Italy, Italians are fiercely proud of the cheeses crafted in their own villages, towns, and provinces, relying on these less widespread cheeses to create their most characteristic dishes. Locally produced cheeses often lend that haunting, undefinable note to pasta stuffings, fillings or toppings for savory pies, and more. They are an integral, colorful part of the mosaic of the Italian regional kitchen. Italian cooks are renowned for their ability to make the most of any ingredient: ingenuity and frugality are part and parcel of everyday Italian cooking. So when a chunk of Parmigiano is reduced to little more than the rind, cooks in Italy don't dare throw it away: they drop it into bubbling soups or saucepots, where it releases its delicious, nutty flavor. Only then is the rind discarded... You can save Parmigiano rinds in freezer-safe plastic bags in the freezer for up to 2 months, then drop them into soups or sauces whenever you want to lend your dish a deep, lingering Parmigiano note. There are some fantastic cheese graters out on the market that will help you grate cheese more quickly and efficiently--the Microplane grater immediately comes to mind. But even if you have the best grater in the world, you will have a difficult time grating a soft cheese if it's at room temperature. Keep your cheese in the refrigerator until you're ready to grate it. This is especially important for soft cheeses like Mozzarella and Fontina, which tend to fall apart when too much pressure is applied as they are rubbed against a grater. Another advantage to grating cold cheese is that it "sweats" less than warm or room-temperature cheese, making it less slippery and easier to hold in your hands. In Italy, Mozzarella-producers will frown if you eat their creamy, fresh cheese even a day after it's been made: they say (and I agree) that Mozzarella is best savored right after it's been lovingly shaped by hand, and that it loses aroma and becomes drier and stringier with every passing hour. Most gastronomy shops and cheesemongers in Italy sell Mozzarella produced that very day under a sign proclaiming "Mozzarella del Giorno" ("Today's Mozzarella"). The Mozzarella is sold in plastic bags in which it floats in a lightly salted, briny water solution that prevents it from drying out. And while many North American gourmet stores and specialty shops sell Mozzarella imported from Italy, it's nearly impossible to buy it the same day it's been made: after all, there's an ocean between us and the cheese's homeland. When you purchase imported Italian Mozzarella, ask when it arrived from Italy: if the answer is a week ago, you know it's not worth the price. If possible, ask the cheesemonger to pack it in a container with a little cool salt water for you (unless, of course, it's still in its unopened package, happily floating in salt water). Eat it as soon as you get home, preferably at room temperature, draining it mere minutes before setting it on the table. Should you have any leftover Mozzarella, store it in the refrigerator in lightly salted water to cover. Store-bought focaccia will work, but why not try our foolproof focaccia recipe for this succulent panino? Preheat the oven to 400 degrees (preferably set on convection bake). Make the fennel: Bring 2 quarts of water to a boil and drop in the fennel. Season with the salt. Cook 5 minutes, then drain and place in a roasting pan. Toss with the olive oil, Parmigiano, and pepper. Roast in the preheated oven for 30 minutes, or until caramelized. (The fennel is delicious on its own, served a side dish to any meat or fish; it also makes a great pasta sauce.) Set aside. Make the panini: Line a baking sheet with parchment paper. Open up the focaccia breads on the counter and spread the olive paste evenly over the bottom half of each focaccia. Top with the roasted fennel. 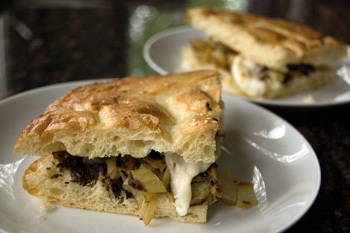 Divide the Mozzarella among the top portion of each focaccia bread. Sprinkle with the salt and Aleppo pepper. Substitute 1 and ½ pounds dried cavatelli for the fresh cavatelli below if time is short. Make the cavatelli: Place the semolina on the counter and mix in the salt. Make a well in the center and add enough hot water to make a dough that comes together; it will take about 1 cup of water. The dough should be firm and form a solid mass. Add more water if the dough is ragged and does not come together (keep in mind that this dough should be quite firm, almost hard, so as to pass through the rollers of the cavatelli machine without sticking together). Knead vigorously 5 to 10 minutes, or until very smooth. Cut into 16 pieces and roll into ¼-inch-wide logs. Roll through a cavatelli machine. Toss with semolina flour and spread out on a flour-dusted tray for up to 24 hours. 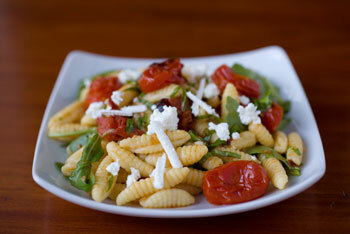 Make the sauce: In a large bowl, combine the Ricotta, tomatoes, arugula, and salt. Stir gently and set aside. Make the chili oil: Combine all the ingredients in a small skillet and heat over a low flame until the garlic and chili are aromatic, about 2 minutes. To cook the cavatelli: Bring 6 quarts of water to a boil. Add the cavatelli and the 2 tablespoons of salt; cook until the cavatelli are al dente, about 5 minutes, tasting often to determine doneness. Reserve ½ cup of the pasta cooking water. This pie is best served warm just after baking, when the crust is especially crisp. The use of buttermilk in the dough is not traditionally Italian (Italians would use more butter instead) but it allows you to cut down on the fat in the recipe and obtain a luscious, crisp, crumbly crust. Make the dough: Place the flour and polenta in a bowl and add the salt and baking powder. Mix well. Add the butter and quickly combine with your fingertips; it is essential that you work as fast as possible so that you avoid melting the butter (this would result in a heavier, less flaky pastry dough once baked). When the mixture resembles coarse meal, add the buttermilk and quickly gather into a mass; there will be lumps of butter visible. Add a little more buttermilk if needed to form a mass. Cut into 2 pieces, one slightly larger than the other, shape into 2 flat disks, and wrap in plastic. Refrigerate 15 minutes. Make the filling: Preheat the oven to 400 degrees. Place the eggs in a small pot and cover with water. Bring to a boil. Remove from the heat, cover the pot, and set aside 13 minutes. Drain, rinse under cool water, and shell the hard-boiled eggs. Cut into thin slices. Place the zucchini in a colander set over a plate. Sprinkle with 1 tablespoon of the salt and set aside for 30 minutes; this purges excess liquid from zucchini, making the filling less watery later. Rinse and blot dry. Heat the olive oil in a 12-inch skillet over a medium flame. Add the leeks and garlic, and cook 10 minutes, or until the leeks are wilted. Add the zucchini and artichokes, season with ¼ teaspoon of the salt and the pepper, and sauté 8 minutes, or until the vegetables are crisp-tender. Transfer to a bowl and stir in the basil, polenta, and Fontina. Adjust the seasoning if needed. Cool to room temperature. Assemble the pie: Butter a 9 and 1/2 -inch glass baking dish. Roll out the larger piece of chilled dough on a lightly floured counter into an 11-inch circle. Roll out the smaller piece of chilled dough into a 10-inch circle. Line the prepared baking dish with the larger dough circle and top with half of the hard-boiled eggs; season with 1/8 teaspoon of the salt. Spoon in half of the filling. Top with the remaining hard-boiled eggs and season with the remaining 1/8 teaspoon of salt. Spoon in the remaining filling. Cover with the smaller dough circle. Crimp the edges to seal well and use excess dough to create a pretty border around the pie. Tear a hole in the middle of the top crust and brush with buttermilk. A luscious combination of peppery Pecorino, nutty Parmigiano, and creamy Ricotta perfectly complements the sweetness of summer zucchini and the ephemeral character of zucchini blossoms. Thinly slice the zucchini (reserve the blossoms) and toss with the olive oil, ¼ teaspoon of the salt, and a pinch of the pepper in a roasting pan. Roast 20 minutes, or until golden at the edges and soft. Cool to room temperature. Beat the eggs in a large bowl with the remaining ¼ teaspoon of salt, the remaining pinch of pepper, cream, Pecorino, Parmigiano, parsley, and zucchini. Line an 8- x 10-inch roasting pan or pie plate with parchment paper. Grease the parchment paper with the nonstick spray and pour in the egg mixture. Dollop the Ricotta over the top. 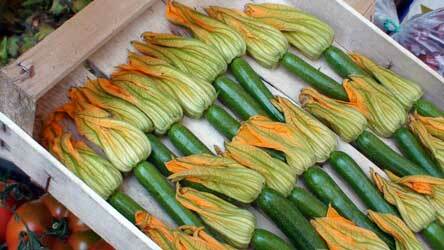 Wash the zucchini blossoms thoroughly but gently and blot dry. Top the frittata decoratively with the zucchini blossoms. Store-bought phyllo dough works beautifully in this lovely springtime pie. Look for phyllo dough in the freezer section of well-stocked supermarkets, and defrost overnight in the refrigerator before assembling the pie. 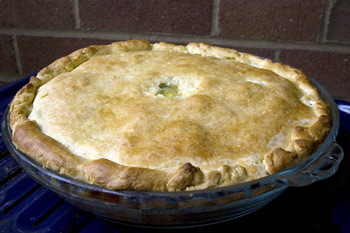 The pie can be prepared (but not baked) up to 12 hours ahead; pour on the egg custard mixture just before baking. Make the filling: Combine all the ingredients in a bowl (remember to reserve the asparagus tips to garnish the top of the pie). Make the pie: Preheat the oven to 400 degrees. Lightly oil a rectangular glass baking dish (9 inches x 13 inches is ideal). Cut the phyllo dough in half, making 20 rectangles that will line the baking pan nicely. Line the baking pan with 1 phyllo rectangle and brush very lightly with the olive oil, keeping the other phyllo rectangles covered with a dry towel while you work (otherwise the phyllo will dry out and crack, becoming very difficult to work with). Top with another phyllo rectangle; continue in this manner, brushing lightly with olive oil and stacking phyllo rectangles, until you have used 7 phyllo rectangles. Spoon on half of the asparagus and cheese filling and spread well, covering the dough. Layer another 6 phyllo rectangles over the filling, brushing between the layers with olive oil. Spoon on the remaining asparagus and cheese filling, spreading it well and covering the dough nicely. Top with the remaining 7 phyllo rectangles, brushing between the layers with olive oil. 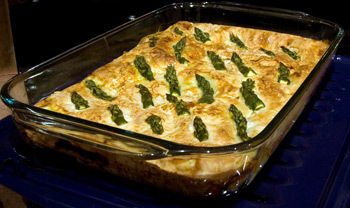 Arrange the reserved asparagus tips in a pretty pattern over the top of the pie. Make the custard mixture: Whisk the ingredients together in a bowl. Pour the custard mixture over the pie. As the pie bakes, the custard will puff and turn into a delicately creamy topping. 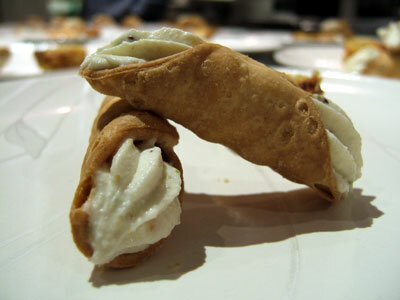 Look for cannoli shells at Italian markets and pastry shops. Make the cream filling: Beat the Ricotta and Mascarpone with the honey, orange zest, and cinnamon until it is perfectly smooth with a whisk. Stuff the cannoli: Pipe the cream filling through a pastry bag fitted with a flat tip into the hollow cannoli shells. Look for phyllo dough in the freezer section of most well-stocked supermarkets, and allow at least 12 hours to defrost in the refrigerator. Make the triangles: In a bowl, combine the herbs, pepper, nutmeg, and paprika. Add the Fontina, smoked Mozzarella, fresh Mozzarella, and goat cheese, and mix well. Place the phyllo dough on a large cutting board, and slice into 4-inch wide strips (you will have 3 strips per sheet). Place under a dry towel while you work. Place one strip of dough in front of you, keeping the others covered. Brush it lightly with the olive oil, cover with another strip of dough, and brush that strip with olive oil as well. Place 2 heaping tablespoons of filling along the bottom edge of the dough. 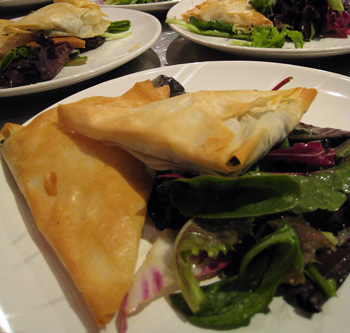 Roll the phyllo dough over the filling to enclose, folding it up away from you as if you were folding a flag. Seal with a little additional olive oil, place seam-side down on a parchment paper-lined 11-inch x 17-inch baking sheet, and lightly oil the top. To bake: Preheat the oven to 425 degrees (preferably set on convection bake). Bake the triangles for 20 minutes, or until golden and crisp. Grana Padano is a nutty, buttery cow's milk cheese from Lombardy, where it has been produced for a thousand years. 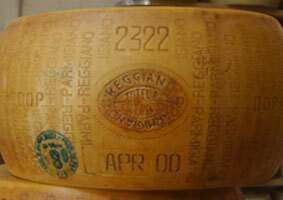 Italians use it as often as they use Parmigiano-Reggiano and it is excellent both grated and as a table cheese. Look for Grana Padano with a smooth, golden-yellow rind stamped with the Consortium’s distinctive seal, and a compact, dense inner structure without holes or color striations. Wrap Grana Padano tightly in a double layer of plastic wrap and refrigerate it up to 1 month; wedges can also be frozen if desired. If using Grana Padano as a grating cheese, it’s always best to grate it just before savoring it—if you really must grate it days before you are going to use it, freeze it to better preserve its aroma. Serve the elegant dish below as a combined cheese and dessert course. If you can't find chestnut honey (which has a pleasantly bitter falvor), use any honey you like; clover or orange blossom are fine substitutes. 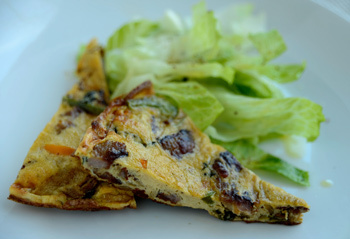 Use zucchini, asparagus, or mushrooms instead of peppers if you prefer, and omit the sausage for a vegetarian frittata. Store leftover frittata in the refrigerator and enjoy at room temperature, or warm a few minutes in a preheated 350° oven. Heat 1 teaspoon of the olive oil in an ovenproof 10-inch skillet. Add the sausage and cook 5 minutes over medium-high heat, stirring; the sausage should be cooked all the way through and lightly browned (cook a little longer if it is not). Be sure to break up the sausage with a spoon while cooking so it is in nice, small pieces. Add the onion, orange pepper, and green pepper, and seaon with 1/2 teaspoon of the salt and 1/8 teaspoon of the pepper. Cook 5 more minutes, or until the peppers and onion are wilted. Stir in the basil. Beat the eggs with the cream, Pecorino, the remaining 1/4 teaspoon of salt, and the remaining 1/8 teaspoon of the pepper in a large bowl. Stir in the hot sausage-pepper mixture, beating and stirring quickly to avoid scrambling the eggs, and pour into the same skillet, dribbling in the remaining 2 tablespoons of the olive oil first. Cook over medium heat 10 minutes, or until set and golden on the bottom. Select a mild, buttery Gorgonzola for this rich appetizer, and cut off its rind to ensure the mousse won't be bitter. In a food processor, combine the Gorgonzola, the walnut halves, the cream, and the pepper until smooth; add more cream if needed to thin it out. The mousse should be as thick as jam. Refrigerate 30 minutes (or up to 2 days) to firm it up; this makes piping easier. 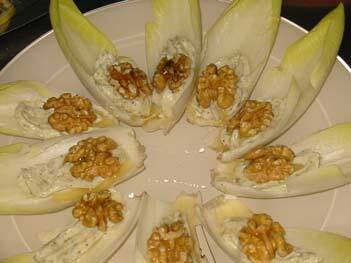 Arrange the endive spears on a platter with the tips facing in toward the center. Spoon the Gorgonzola mousse into a pastry bag fitted with a star tip. While hardly traditional in the Italian kitchen, flour tortillas provide a lovely thin shell for the cheese and vegetable stuffing. In Italy, thin, pliable flatbreads called piadine--made from flour and lard--would be used instead, but tortillas are a fabulous substitute. Be sure to buy Fontina from Val d'Aosta, a nutty cow's milk cheese that melts beautifully, for this easy finger food. Place 4 of the tortillas on a work surface. Top each with one-quarter of the Fontina, tomatoes, and arugula; season evenly with salt and pepper. Cover with the remaining 4 tortillas. Heat 1 teaspoon of the olive oil in each of two 10-inch omelet pans. Slip in one of the tortillas in each skillet, and cook over medium-high heat until golden on the bottom; turn and cook the other side until golden. It will take about 5 minutes total. Cook the 2 remaining tortillas in the remaining olive oil in the same manner. You can top the baguette slices with slices of fresh Mozzarella instead of goat cheese for a milder flavor. Arrange the baguette slices in a single layer on an 11- x 17-inch baking sheet. Toast in the preheated oven until golden on top, about 5 minutes. Raise the oven temperature to broil. Line the same baking sheet with aluminum foil; place the peppers on it, cut side down, and broil in the preheated oven until they are blistered and black, about 15 minutes. Remove from the oven; wrap in the aluminum foil that lined the baking sheet and set aside for 15 to 30 minutes; the steam in the foil packet will loosen the skin of the peppers, making them easier to peel. Unwrap the peppers, then peel and remove the seeds; cut into strips and toss with the olive oil, salt, pepper, garlic, and basil in a medium bowl (this can be done up to 4 days ahead and refrigerated). Try to buy imported Italian Mascarpone (rather than domestic) for this and other recipes: the flavor is richer and creamier, the texture smoother. In a food processor, purée the Mascarpone with the snipped chives, salt, and pepper until smooth and pale green. 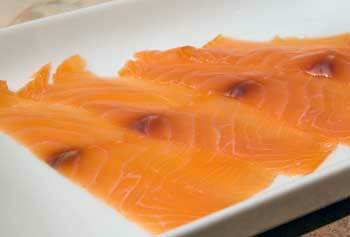 Spread on the pumpernickel bread triangles and top each triangle with a half-slice of smoked salmon. The list below comprises Italy's most important, as well as most interesting, cheeses. Many of these cheeses are available only in Italy, and some are known only in their zone of production. Make it a point to explore Italy's cheeses both on their native soil and here: in Italy, head to a salumeria (the Italian equivalent of the delicatessen, where cured meats, cheeses, and more are sold) and to the local dairies whenever you can; and at home, take a trip to a well-stocked cheese shop with this list in hand. Fatty cheese with a compact texture; aged 3 to 5 months. Produced since the year 1000. Asiago Pressato made from whole milk and pressed in metal or plastic molds, then aged a maximum of 40 days, is more widespread, while Asiago d'Allevo, made from partly skim milk and aged up to 2 years, is the experts' favorite. Firm table or grating cheese. Sharp mountain cheese; good for grating. When aged up to 2 years, it acquires greenish streaks. The shepherd's cheese, aged a minimum of 2 months. Mountain cheese. The most flavorful is made at an altitude of 6,000 feet, neat the Gries glacier. When it is aged 3 to 4 months, it resembles Fontina. Matured at least 70 days and up to several years. Creamy, compact, large-holed blue cheese. Laced with chili pepper; aged 2 to 3 weeks. Aged 45 days to 6 months. Ideal for melting, aged from 2 to 7 months, similar to Fontina and Bitto. Spiced, preserved cheese made by adding butter, spices, herbs, and grappa, Génepy, or white wine to fresh cheese and fermenting it for weeks or months. Ricotta that becomes sharp as it ages and is sometimes preserved in olive oil with peppercorns. An aged version with worms that is considered a delicacy. Fresh Mozzarella; best eaten the day it is produced. Mozzarella stuffed with cream; best eaten within 24 hours of being made. The most famous is from the town of Andria. Fresh Provolone with a heart of butter; tied in pairs and eaten with celery and fennel, or enjoyed at meal's end for dessert. Cheese with a heart of butter; best made from the milk of cows that gave birth 1 year before. Pecorino fermented in sheep's milk until tiny flies still at the larval stage develop; production is now banned. Pear-shaped, hung to age on ropes for a minimum for 15 days; excellent melted. Delicate, fatty cheese made from milk obtained from the ancient Podolica species of cattle, brought to Italy by barbarian invaders between the fourth and sixth centuries; aged 6 months to 1 year. Firm cheese tied with ropes and hung to age a minimum of 15 days. Caciotta coagulated with vegetable rennet obtained from wild cardoons; colored and flavored with saffron. Dry-salted, served fresh after days of aging or aged for months and used for grating over pasta. Ricotta flavored with coffee and lemon zest, eaten on feast days. Black truffle-laced cheese; semifirm, milky, made mostly in Norcia. Firm cheese; young or aged, sometimes flavored with chili pepper. Semifirm cheese from the town of Montefeltro; has a thin rind and is aged about 2 months. Round and flat aged up to 2 weeks or cylindrical aged up to a few months; flavored with saffron. Unique cheese from Osimo, somewhere between a Ricotta and a firm cheese in texture. Cheese set to drain in straw baskets until firm. Handmade and straw-yellow in color, pungent. Sharp, firm cheese aged from 2 to 10 months; it owes its name to the fact that it is shaped in molds called canestri. Pungent, firm cheese from the Carnic Alps. Michelangelo bought land in Urbino just to have a steady supply of his beloved cheese. It has a thin yellow rind and fresh flavor. Wrapped in walnut leaves, aged up to 12 months in terra-cotta jugs. 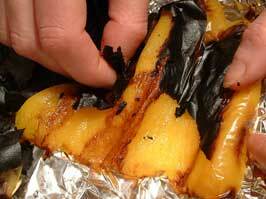 Similar to Cacioricotta, but flavored with calamint; sold wrapped in ferns, tied with a piece of broom. Traditionally made at home from casa, meaning "home." Tastiest aged 6 months. Light and delicate, usually shaped into a triangle. Similar to Gorgonzola; aged 2 to 6 months in caves, it sports bluish streaks when mature. This cheese tastes like the essence of sheep's milk; it is made only from milk and rennet, without salt, and is delicious with honey. Aged only a few days; creamy, soft, white, slightly tangy, and spreadable. Clean and decided in flavor, for eating or grating. Full-fat cheese from Fagagna, near Udine; soft, fresh, and mild. Made from raw milk; soaked in a salt brine, then aged from 1 month to 9 months. Perfect for grating when mature. Soft, raw milk cheese aged in stone cellars until it acquires a fine gray mold on its surface. Made for centuries; one of Italy's preeminent melting cheeses, it has a nutty aroma and compact flesh. Subtle when young, becomes more penetrating as it ages. From the mountains around Brescia; matured for 1 month. Sports a thin yellow rind with grayish striations, a smooth, white flesh, and a delicate flavor. When fresh, excellent doused with olive oil and a sprinkling of black pepper or for stuffing focaccias and for cooking; when aged, good for grating. Semifirm cheese, aged a few months. Sometimes flavored with oregano, paprika, or lemon leaves. White, barely salted, creamy when young; sharper when aged, straw-yellow in color. Can be spiced or flavored with herbs. Cheese ripened in tufaceous pits since the 1400s. Sharp, firm, with a grassy scent. Literally, "salted cheese, this cheese is firm, cured in a brine of water, salt, and cream for a minimum of 2 months. A specialty of the mountains near Bergamo, aged 45 days to 6 months. 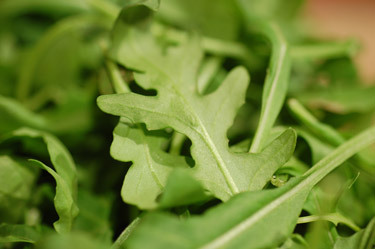 Similar to the Stracchino of Lombardy when fresh; best for grating when aged. Similar to Feta, this cheese is often eaten with sliced tomatoes and olive oil or dropped into vegetable soups. It melts nicely. From Santo Stefano d'Aveto; it has a pleasantly sharp taste and flavorful rind because as it ages it is rubbed weekly with olive oil. Salted, dry Ricotta. Sharp and crumbly. Italy's most beloved blue-veined cheese, matured 2 months when Dolce and 3 months or longer when Piccante. Creamy in texture and pungent in flavor; melts nicely. Grainy grating cheese with a nutty aroma; aged only 2 months. Little-known grainy-textured cheese made near Lodi, excellent for grating and eating at the table; aged 2 to 4 years, it has greenish striations and moisture seeping from its flesh. Firm, grainy cheese; aged at least 15 months, best for grating. Tender, fresh cheese that is the ancestor of Bettelmatt. Creamy, fresh cheese similar to Ricotta; delicious on bread. Soaked in a salt brine for 2 days, rubbed with oil, and aged for at least 2 months. Eaten as a table cheese or cooked. Trieste's spreadable cheese, made by combining Ricotta and butter with anchovies, onion, capers, mustard, paprika, chives, and parsley. Pressed, salted, and aged under a layer of herbs to acquire its distinctive flavor. Blue-veined cheese; creamy, compact, melts nicely. Firm, dry-salted, aged in grottoes or caves for a minimum of 8 months, then rubbed with olive oil. Rare cheese, amber-yellow, aged on mats of woven reeds and then in glass bottles. Produced in March (hence its name); aged briefly, it has a reddish rind and is compact, semifirm. Fatty, creamy, spreadable cheese obtained by adding a souring agent to fresh cream and letting it ferment for 24 hours; ideal in desserts. Straw-yellow in color, crumbly, and firm; aged from 6 weeks to over 1 year. Produced in the southern portion of the province of Verona. Sold young from whole milk and aged from skim milk. Rare unpasteurized cheese from Alpine pastures. Tender, creamy, offered only by a handful of producers; historically, it was buried under hay in the cowshed to age. Creamy, fresh Mozzarella; also sold in 3'-long braids. Part of the provinces of Rome, Latina, and Frosinone produce Campania's famed Mozzarella. Creamy, fresh Mozzarella; best enjoyed the day it is produced. Soft and white, it has no rind since it is aged only 4 to 10 days. Rare cheese with greenish mold. Spherical cheese, small and semifirm. Fresh raw milk cheese with white flesh and no rind. In the plastic curd family; soaked in a salt brine, aged 1 month or longer. Semifirm Provolone shaped like a ball. An unusual cheese made entirely without salt from raw milk; soft and mild with a delicately bitter aftertaste. King of grating cheeses, this nutty cheese is produced on an artisanal level in 650 tiny dairies scattered across the region. Very young Pecorino, often savored with cured meats as an antipasto. Smoked cheese; sometimes studded with black peppercorns, aged about 6 months. From the Ciociaria; aromatic, light, aged at most 2 months. From Crotone; dry-salted or soaked in a salt brine, aged from 3 months to more than 1 year. Older specimens can be aged 2 years and are quite pungent. Has a glorious scent of grass. Dipped in a salt brine; delicate, aged 3 to 6 months. From Carpegna; intensely aromatic, wrapped in walnut leaves. Firm, crumbly, and straw-yellow in color; aged 2 months to 1 year. Firm cheese; aged in underground caves. From pasteurized milk; salted over a period of 2 months, rubbed with olive oil, and aged 8 to 12 months. Despite its name, Sardinia is the biggest producer of this classic cheese. The young is aged up to 2 months, the aged up to 6 months. Both are wonderful on the grill. Firm, crumbly cheese; pale straw-yellow in color, salty, and pungent. Mild and milky in flavor when young, pungent and crumbly when aged. Firm Pecorino studded with peppercorns; crumbly, firm, and sharp. 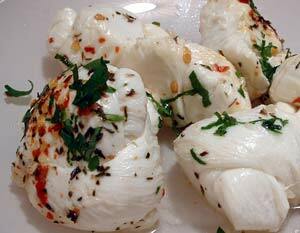 Plastic curd cheese similar to Scamorza; often grilled. Scented with saffron and studded with black peppercorns; firm and sharp. Straw-yellow in color, cured in a salt brine; considered Fresco after 2 months of aging, Mezzano after 6 months, and Stravecchio after 10 months, yet retains its mild, delicate flavor even as it ages. Uniquely Ligurian dairy product halfway between cheese and soured milk that is used in pesto and in sauces; tasty on bread, dusted with sugar for breakfast. Salt brine-cured cheese; aged up to 2 years and has marvelous melting potential. Salted once. In Apulia it is typically sold very young, while in Sicily it is usually aged. Fresh Provolone with a porcelain-white color and creamy texture. Similar to Mozzarella but saltier and more decided in flavor. Pear-shaped cheese aged 3 to 4 months. It can also be formed to resemble animals. Plastic curd cheese; pear-shaped, smaller than Caciocavallo, semifirm and good for melting. Belongs to the family of pasta filata, or "plastic curd cheeses; molded by hand into its classic pear shape and tied by a short noose. It melts beautifully. Compact, elastic cheese aged from 6 months to 2 years; quite pungent. It is sometimes sold under the name of Spetz Tsaori. Resembles Taleggio; aged from 5 days to 1 month, it is soft and creamy, becoming slightly bitter as it ages. Has a smooth, thin skin, no rind, and creamy color. When young, it is excellent on the grill; as it ages, it becomes better suited for grating. Aged at least 1 month, it is firm but elastic, with a thin grayish-red rind. Melts very nicely and is similar to Fontina. Flat, creamy, Ricotta-like cheese; aged 5 days, it is spreadable, buttery, and creamy. Rich, fresh cheese produced in small artisanal dairies; traditionally eaten dusted with sugar and a pinch of cinnamon. Full-fat cheese; the rind is rubbed with flour. It vaguely recalls Brie. Usually sold fresh, when it is creamy and spreadable. Versions that are spiced, aged, or smoked also exist. Smoked, firm Ricotta obtained from the leftover whey from making Montasio; good for grating. Unusual Ricotta obtained not from the leftover whey from cheese-making, but from milk, whey, and salt; aged from 2 to 6 months. 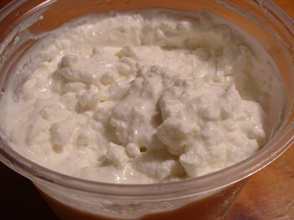 Creamy, white Ricotta; used mostly for cooking and baking. Sharp, spreadable, fermented Ricotta; sometimes flavored with pepper and vinegar. Baked Ricotta that develops a thin reddish-brown rind in the oven; sometimes flavored with black pepper. Ricotta whose fermentation starts in March; it sports a light coating of mold after 1 month of aging and can be smoked. 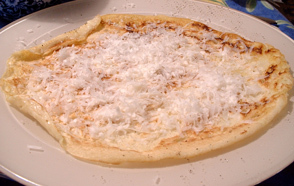 Ricotta that becomes sharp with age; the Forte, "strong, is aged up to 3 months and is best grated. Ricotta sold fresh (Fresca) for desserts and pastries or salted (Salata) for grating. Salted Ricotta; firm, crumbly, meant for grating. Rare cheese, sharp yet milky in flavor, with a grassy scent. Robiola that sports a reddish rind when aged; it has a soft flesh and mild, creamy flavor. Made near Asti, this creamy, spreadable Robiola is aged only a few days; it is often conserved under a layer of olive oil. Pecorino whose rind is rubbed with olive oil, acquiring a lovely red color as it ages. 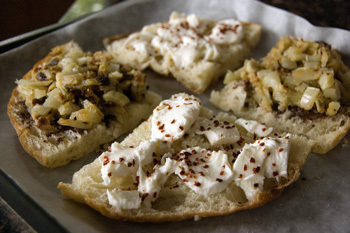 Spreadable Ricotta flavored with pepper, caraway, chili, or fennel seed. Salted Ricotta aged at least 1 month. Pear-shaped plastic curd cheese; buttery and delicate, it is best within 3 days of production. The smoked version is usually grilled or spit-roasted. Firmer than Mozzarella, softer than Caciocavallo; aged a few days after a soak in salt water. Cheese obtained from the curds that seep out of molds used for making other cheeses. Classic mountain cheese, soft, creamy in flavor, and mild, matured 3 to 4 weeks. Piedmontese Ricotta; fresh, creamy, and spreadable. Ripened from 6 months to 1 year; recalls Friuli's Montasio. Fresh, creamy cheese without a rind, similar to the Crescenza of Lombardy and Squaquarone of Romagna; wrapped in walnut or fig leaves after 7 days. Aromatic cheese produced from winter milk; aged as long as 2 years. Similar to the Stracchino of Lombardy, this cheese is creamy, mild, and fresh. The rich, creamy stuffing of Burrata served in majolica pots. Creamy, spreadable, and slightly tangy; similar to Crescenza. Semifirm cheese that acquires a pleasantly pungent flavor when aged. Born around the turn of the second millennium in the Val Taleggio, this cheese is aged about 40 days and has a buttery taste and a rind with an aroma of truffles. Family of cheeses produced from raw or pasteurized milk; aged from 3 to 18 months. Cylindrical cheese with a delicate, creamy flavor, yellow-to-reddish rind, and compact flesh; aged from 15 days to 2 months. From unpasteurized milk; cured in a salt brine, delicate in flavor, and aged 2 months or longer. Small cheeses, fresh and white, usually drizzled with wine vinegar and flavored with garlic and chili. Large wheel of Pecorino Toscano; aged 6 months, sometimes spiced with black peppercorns. Unique cheese from the Valle del Primerio; matured a mere 2 to 3 days. Raw milk cheese aged 5 months in wooden barrels, repeatedly doused with wine, and flavored with the lees of Sciacchetrà (a raisined dessert wine). Firm cheese with a milky flavor and grassy scent; salt-brined, then aged 2 to 10 months. The Valtellina's most important cheese; ripened at least 70 days, ivory in color and soft. Plastic curd cheese; melts beautifully. Plastic curd cheese; shaped into an oval and eaten after 2 days of salting. Compact, elastic mountain cheese aged from 6 months to 2 years, produced at an altitude of 3,000 feet.